A simple recipe but taste good for a simple life peoples. Best enjoy with a fried fish specially galunggong or tilapia. Heat wok with a small amount of oil. Saute garlic, onion, and ground pork and let it cook for 2-3 minutes while stirring. Add fish sauce (patis) depends on your taste. Cover and cook it for a couple of minutes. 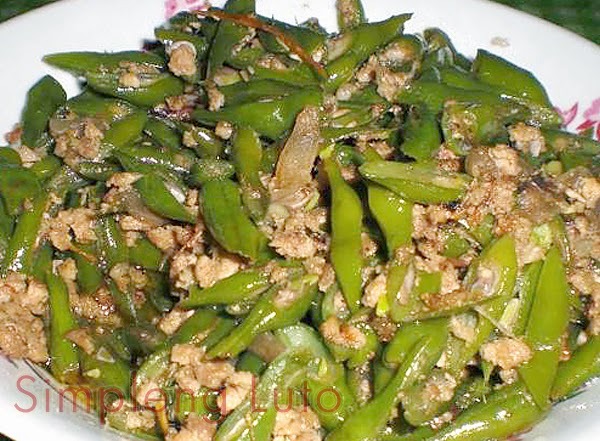 Add Baguio beans and stir until all mixed. Soy sauce, msg or magic sarap, and black pepper to be added. Stir, cover, and let simmer for 6 minutes on medium low heat and wait until the beans are tender. Serve with rice and Enjoy!